After discovering the details on July 26th, the Standing Rock Sioux Tribe, with other Native American and social activist groups in solidarity, began a series of protests against plans by Dakota Access to build a massive, 1,172-mile oil pipeline through much of their sacred territory including Lake Oahe and the Missouri River. Among the various environmental hazards that would come with the pipeline, the most worrying for the Lakota Sioux and other local communities is the potential contamination of the Missouri, which serves as a prime source of water irrigation. The project, which according to Dakota Access, would cross another 209 rivers, was going to produce hefty profits for the Energy Transfer Partners company to the tune of $3.78 billion. The eventual pipeline would transfer an estimated 470,000 to 570,000 barrels of oil a day. Black gold is as highly profitable here as in the Middle East. What cast a disturbing historical shadow over the situation was the fact that the pipeline had been approved by the U.S. Army Corps of Engineers. By approving the pipeline through tribal lands and even sacred burial grounds, the U.S. government was violating terms of the Ft. Laramie Treaties of 1851 and 1868. By not consulting the tribe, the government also violated the United Nations’ Declaration on the Rights of Indigenous Peoples. Of course, government actions on tribal lands without consent are nothing new: General George Armstrong Custer is alive and well in the Dakotas it seems. The Standing Rock tribe decided to first take matters to court and filed for litigation against the Army Corps of Engineers in the District of Columbia on July 27, but to raise awareness, mass protests were organized at the building site of the pipeline itself. The only presidential candidates to make an appearance were Green Party presidential and VP candidates Jill Stein and Ajamu Baraka. 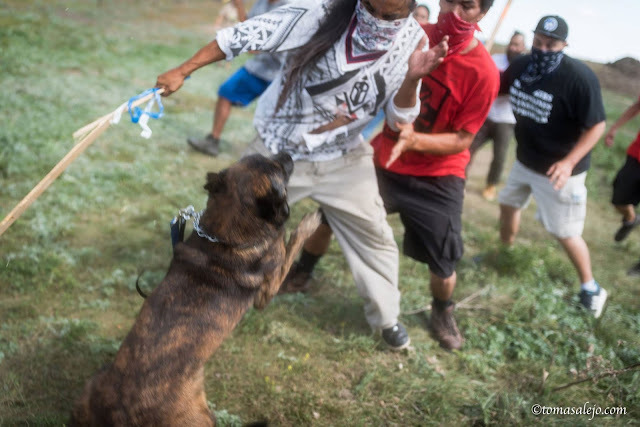 On September 3, the situation became volatile when private security guards for Dakota Access threatened and assaulted protesters with attack dogs, pepper spray and clubs. In the aftermath, arrest warrants were issued for, among others, Democracy Now journalist Amy Goodman and even Stein herself (under accusations of vandalism for spray-painting “I Approve of This Message” on a bulldozer). On September 9, a federal judge denied the tribe’s request for a halt to construction. But in a twist worthy of a political thriller, the Obama administration announced mere minutes later that construction would cease. The official Department of Justice statement read, “Construction of the pipeline on Army Corps land bordering or under Lake Oahe will not go forward at this time. We request that the pipeline company voluntarily pause all construction activity within 20 miles east or west of Lake Oahe.” The administration went even further, saying it would consider consulting with the tribe before any further action. A significant development that can be seen as a victory for social activism and the fight for Native American rights, it proves that rising up in solidarity can still push back against the corporate designs of powerful, wealthy entities. But it should also serve as a warning that nothing has changed when it comes to the struggle of the oppressed against the powerful. Cold, cynical analysis might conclude that the last thing Obama needed in an election season was the image of Bull Connor-style thugs beating down Native American protesters. It’s quite suspicious that the administration stepped in just as blood was about to be spilled. Major interests will continue to defend their investments by unleashing the hounds. The images of the Dakota Access goons surrounding the protesters with dogs and clubs felt like a return to old school union busting from the Depression days. The Obama administration also cancelled the notorious Keystone XL Pipeline last year after numerous protests. Then as now, communities are forced to make their voices heard through protest and even clashes. In a sense this was a truth misunderstood even by Bernie Sanders partisans, who believed in his progressive rhetoric and energy, but assumed radical changes would come easily through a ballot box. The lessons of the Dakota stand-off should be taken seriously by those in Los Angeles living under the shadow of gentrification or police brutality. There is a line that can be drawn between private energy interests attempting to take over tribal land and private real estate powers devouring communities to benefit a specific social sector. And in the same fashion that Dakota Access security had no qualms attacking protesters with sheer menace, police in the U.S. are subtly encouraged to patrol working-class streets like some Syrian war zone. There are those that would argue that policing efforts in these largely ethnic and economically marginalized communities become more pronounced as a matter of unofficial policy once the areas have garnered the eye and the interest of those with substantially more means, who only a year or two before who have been hard pressed to locate the neighborhood without the aid of a map. Many of these newcomers are intrinsically unable to divest themselves of the entitled belief that their “discovery” of and arrival in the community somehow represents progress or improvement, because, after all, who but they are equipped to convert these uncultured and desitute enclaves into places worth living and working in? Voters must also ask themselves about the silence from the major presidential candidates. It is not hard to imagine what Donald Trump thinks about the whole pipeline debate, but Hillary Clinton has remained eerily silent. Even Sanders himself made an appearance in Dakota last week, demanding respect for Native American rights. But Clinton’s silence is a sign she doesn’t wish to rattle the boat with the major business interests surely pumping money into her campaign. Business as usual as they say. In a wider historical context, the Dakota pipeline protests are a stark reminder that history is not confined to the dusty shelves of libraries; it continues every day. The neglect of Native American rights is as glaring today as it was over a hundred years ago. To address many of the social fissures happening today, it is important to understand the roots of conflicts from the nation’s very founding. It was a smart move for the White House to side with protesters in this case, but there needs to be deeper changes based on true respect for communities and their experiences in this country. In that sense, the long history that casts a shadow over the Dakota pipeline protests doesn’t just involve the Sioux, it involves all of us.